I can’t stress enough how important it is to work with someone who understands making clothing, and other handicrafts out of fabric and textiles. I spoke with Jen Kot, a professional engineer who makes her own clothing, knits and creates all kinds of interesting objects with textiles. As a technical person, she understands how the underlying technology works. As a crafty person, she deeply understands the application and costs of different textiles, the pros and cons of using different materials, what is easier or more difficult to work with, and what looks good. Clothing is one of the most powerful tools we have to create and reinforce our image, or how we want the world to perceive us. One of Jen’s criticisms of much of the current wearables such as bracelets, watches and glasses is that they look “nerdy.” To a techie, we might not find this to be important. We may overlook the form for the features, and even find something awkward looking to be appealing. When you are competing in a world where fashion dictates what is available for us to wear in stores, we need to understand how other people want to be perceived. When Jen and I brainstormed uses for smart fabrics, my solution ideas were much more functional. Her ideas were much more whimsical and fun. I kept thinking about how the technology could be applied and impact our lives, while she thought about what would look appealing as well as be engaging and fun. 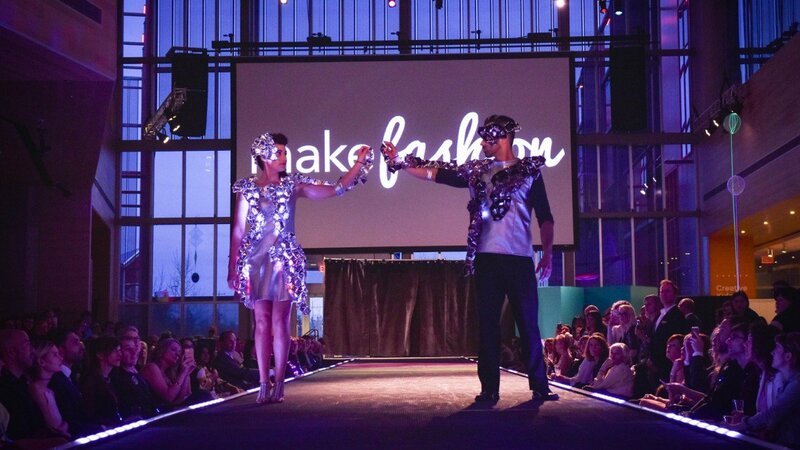 Shannon Hoover, co-founder of MakeFashion, an organization that brings technologists and designers together to collaborate with wearable tech also reinforced this view. He also understands both the visual and technical worlds that are possible with smart fabrics. Human expression. This is an artist and fashion-designer focused perspective. Shannon goes even further, and says that clothing helps people tell the story about who they are – it is a narrative generator. It also gets people talking to you – it gets their attention and evokes emotions. Clothing is a great conversation starter. So what conversations do we want people to have about what we are wearing? Using fabrics is complex, you need to understand how something looks on a person, how it feels on the skin, what colors are in fashion and how different cuts and shapes look on people. Fashion changes constantly. To make smart fabrics work, we will need both the technical view (here is how we make the technology work) and the fashion designer’s perspective (here is how we make the product look great and be appealing to wearers.) As a technology designer, talking to people who design clothing and furniture is exciting and helps generate new ideas. I understand the basics of what they are talking about, but their experience and perspective is completely different. When design materials use combinations of different technologies, our solution ideas are much better when we work together with other disciplines and share expertise and different perspectives. Making clothing is one way to use smart fabrics, but fabrics are used in a lot more things than clothing. For example, Nomex was used in heat shields for the space shuttle, Gore-Tex is used as a tissue replacement in medical procedures, and Kevlar is used to create high performance vehicle components. In fact, IoT developer and bbotx co-founder Geoff Kratz feels that smart fabrics have even more potential in products other than clothing. For example, he sees using smart fabrics in vehicle upholstery could provide alternatives for inputs and displays and other feedback mechanisms for safety purposes. Geoff also sees furniture as another good candidate. Smart fabrics could integrate with entertainment systems to provide an even more immersive experience. Chairs could sync up with other systems and provide you with reminders or safety information. Carpets could have safety lighting that is triggered by darkness or emergency situations. There is enormous potential for these sorts of ideas as well as interactive, connected art applications for homes, and public areas. Quilter and chemical technologist (and reviewer of this article) Cindy Johnstone shares Geoff’s views. Since she quilts, she immediately thought of applications for blankets. Cindy says that portrait quilts or family quilts are very popular. She says the resolution of the images would be so much better if digital technology could be incorporated. An active smartfabric quilt that could tighten the batting to make it warmer in the winter and relax the fibers for summer use would be useful. People could use one blanket for different seasons, rather than having more than one blanket. Cindy also sees health care applications where adding in technology into blankets used by patients could provide more insight and control into patient care. As computing and wireless technology “disappears” into real world devices, there is enormous potential to solve more interesting problems. We often look to organizations with well-funded R&D (research & development) programs to set the tone for the rest of us. There will be likely be useful, popular, smart fabric products developed by some familiar leaders in the tech sector. The space is also ripe for disruption by some new up and coming organizations we haven’t heard of yet. Due to the combination of physical and virtual worlds, investment in these kinds of products will be more expensive than software alone. One area that organizations are working on developing smart fabric and similar technology for is the health and wellness sector. Calgary-based Orpyx Technologies is a company that provides a wearable sensor platform for healthcare. In one of their products, they use embedded sensors in footwear to help people with diabetic neuropathy. Those with diabetic neuropathy have nerve damage and often don’t feel their limbs as well as other people do. Because they can’t feel when their feet hurt, they can injure them permanently. In severe cases this leads to amputation. Orpyx have developed a system to warn patients before this happens. A sensor-embedded insert worn inside a patient’s shoe gathers info from the sensors (pressure, etc) and transmits it to a smartwatch which then alerts them to potential problems. Stephanie Zakala, Marketing and Inside Sales Manager at Orpyx says that they have been watching smart fabrics closely as a next step for some of their solutions. For example, rather than using embedded sensors within shoe inserts, a smart fabric sock would be a fantastic solution. So far, though, there are technical limitations with the smart fabrics they have looked at. It is difficult to make socks with sensing capabilities that are comfortable, washable, and reliable over time. Stephanie says that clothing is particularly challenging because it creates hostile environments for electronics. Shoes and undergarments are worn in conditions with pressure, high heat and humidity. Also, the high cost of many smart fabrics is currently prohibitive for many mass market consumer applications. Other organizations are using sensors embedded in clothing to measure heart rate, temperature and other vital signs for health care, and athletics. As smart fabric reliability improves and prices go down, many organizations will find them to be a great alternative technology for some of their current solutions. Beyond that, they will create new products and services by using smart fabrics to solve problems we were unable to address without this technology. Great ideas don’t just come from companies, they can come from crowdsourcing as well. Craft communities are important crowdsourcing resources where people share interesting ideas for clothing and crafts. In these communities good ideas rise up to prominence because they work and are easy to replicate. Currently, there are knitting and quilting clubs, fashion collectives and maker fairs sprouting up all over, where people support each other socially, teach each other new skills, and most importantly, share patterns and design ideas so that others can make the same item. As people try different patterns that others have created, they put their own unique spin on things, and improve on the original ideas. With such a large community, many ideas are shared and tested at large scale; far outstripping the resources of most companies R&D budgets and timelines might allow. Failure isn’t tied to profits and loss, so people can experiment without fear, and the best ideas tend to win out by becoming popular and emulated more frequent. Homebrewing was a hugely vital part of the early Personal Computer (PC) development, and this spirit of creativity and doing it yourself is evident virtually in craft communities. Adding technology to traditional materials is a natural step. In fact, while researching this piece, I found more people from craft communities that were interested in smart fabrics than technologists. One community that reminds me of early PC homebrewing and software clubs is Ravelry. Ravelry is a community for people who knit and crochet, and it has a unique blend of features that allow people to share ideas and patterns. Local real-life knitting clubs have been started as a result of people from the same geographic location meeting virtually on Ravelry, then getting together and helping each other out. Sharing patterns and pictures of finished items is a huge part of the Ravelry experience, and popular patterns that help people create things that look good and work start to emerge. Crowdsourced ideas from maker communities are often more fashion-conscious and whimsical than their corporate counterparts. Sometimes, as technologists, we forget that having a product that looks good and is fun is just as important to people as a life-saving device. It just depends on the context. In fact, products that look good and are fun, have a much larger market appeal. Maker communities are an area to watch because they not only filter the ideas for us, they remind us techies that the world can be a fun, colorful place and we need to incorporate those aspects into our designs. These communities have access to a wealth of knowledge, and as digital designers, we can learn a tremendous amount from them. Once they have experimented with smart fabrics for a period of time, we can benefit from communities of people figuring out what works best for certain applications. These sorts of organizations are filled with people who like to experiment and create things for themselves and their friends. If you’re wondering where to start, Jen Kot says, make what is interesting and useful to you and then share it. The crowd can create at scale, so the good stuff will get copied and become popular. When looking at technology first, and then trying to find useful applications of it, we can mistakenly create products that people don’t like. It’s important that technology solutions are actually useful and will be used by real people. Many wearables are not worn after a few months of use. In 2014, Endeavour Partners surveyed people who use wearables and found that one third of activity tracker users stopped using it after six months. Once people get a sense of the data that is measured and how that is reflected in their activities, they don’t seem to find a lot of value in the wearable information anymore. It is vital to use technology that actually solves problems for people. Author and thinker, Simon Sinek talks about “starting with why” we are doing something. In technology, we work a lot with the “what”. We have access to cutting edge technology, and we need to spend a lot of time learning how to master it and apply it. Many wearable and smart fabric demos seem to reflect this. People talk a lot about the technology and how it works, but they fail to make a compelling case for why it’s useful to me in my life and world right now. Very few people care about technical details, they want something that serves a purpose, looks good and fits their budget. Think of buying a new pair of blue jeans as an example. When I shop, I look for something that solves my problem (I need clothing, specifically a new pair of jeans), that fits my personal style, that I look good wearing, and that I can afford. Invariably, I am drawn to a stylish visual design and a certain level of quality of materials and workmanship. Unfortunately, that means the jeans I would like to consider buying are expensive. Most importantly, the jeans have to fit my body and look and feel good while wearing them. So I start compromising to see if I can find something that fits my budget. If you are a smart fabric designer, how are you going to convince me to pay more money for something that has electronic capabilities in my jeans? It may just feel like an unnecessary extra. You have to convince me, the buyer, why I absolutely need this new technology in my jeans. Will they fit better? Will they look lighter? Will they keep me warmer or drier or more comfortable? Will they provide data or notifications that are incredibly handy, or that I just can’t live without once I have them? Whenever I design something new with complex technology, I strip the problem down to its essence, and I remove digital technology from the solution ideas at first. If I can use paper, pen, materials readily at hand and perhaps some physical services like mail or parcel delivery, what would I do? If you can fully understand the underlying problem you are solving and provide alternate ways of solving it with different technologies, it’s time to add in the digital technology to form a solution. It’s amazing how your perspective changes, and that pet feature you just loved in the technology doesn’t necessarily translate into an ideal product for the people you are designing for. An ideal product should be so superior using smart fabrics to other, older technology, the customer will want it and will wonder how they got by without it in the past. Paul Hanson (bbotx CEO) warns designers for wearables to avoid focusing on the technology first, then looking for solutions in people’s lives. Instead, when we design wearables for people, we have to think about the person wearing the device first, what they are doing in their lives and how the technology that the device provides is useful for that person. However, it can’t stop there. Beyond the device itself, the generated data and activities recorded or performed by the wearable are much more useful when you take an entire system (such as your interactions with other people) into account. Gathering a lot of data with a smartfabric wearable and displaying that data on a smartphone has limited usefulness. What does it mean? What should the wearer do? With passive wearables, which are usually used to gather data, there is limited value in providing activity data only to the end user. There is infinitely more value, if that data can be shared with people who can interpret the data, and have special expertise to help apply that to help you improve your life. In healthcare, for example, clothing that monitors heart rate is incredibly useful if care givers or specialists have access to the data to help put context around it and point you towards behaviors that will benefit you. This requires a complex, secure computing system to support not only the wearable and the user, but everyone else who needs to be involved. Active wearables need to interact with a system too – the immediate real world around us. Imagine a winter jacket that changes form depending on temperature so you are always at optimal comfort, or a shirt that changes color depending on lighting. The data the wearable interprets around them can trigger changes in the form or attributes to enhance the experience of the wearer. Ideally, the user should be able to control these changes themselves if they want to override them. In my last article on wearables, I suggested that the real world is your primary user interface. 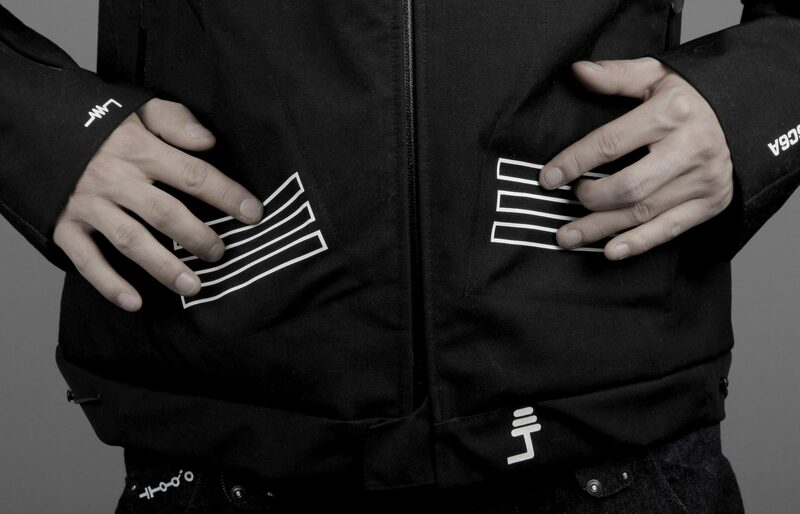 With smart fabrics that can be used as clothing, user interfaces can also be on people’s bodies. Not only do you need to understand where the user is, what they are doing and what the environmental conditions are, you also have to understand where on the user’s body the user interfaces and inputs will take place. Finally, you have to understand the inputs and outputs and displays themselves. This is incredibly challenging. On a PC, we are used to input methods (keyboards, pointers, stylus, microphones, fingers, etc.) and output on a screen, from speakers etc. The end user tends to use the PC in more ideal conditions, and we don’t think too much about what else is going on around them. Mobile devices complicate I/O matters, because now we have to think about limited actions, and what else is going on in their world as they use our programs on the move. Wearables such as smart watches and activity trackers complicate this further, since they can overly distract from our real world activities, and since we are wearing them on our wrists or clipped onto clothing, we can’t get away from them if they needlessly over stimulate us with notifications and alerts. With smart fabrics used in clothing or furniture, the devices are right up against our skin and have much more opportunity to distract and annoy us. Can you imagine how terrible an experience could be if your clothing was vibrating or lighting up and you couldn’t stop it? It could be embarrassing, irritating, and could even cause injury to the wearer. 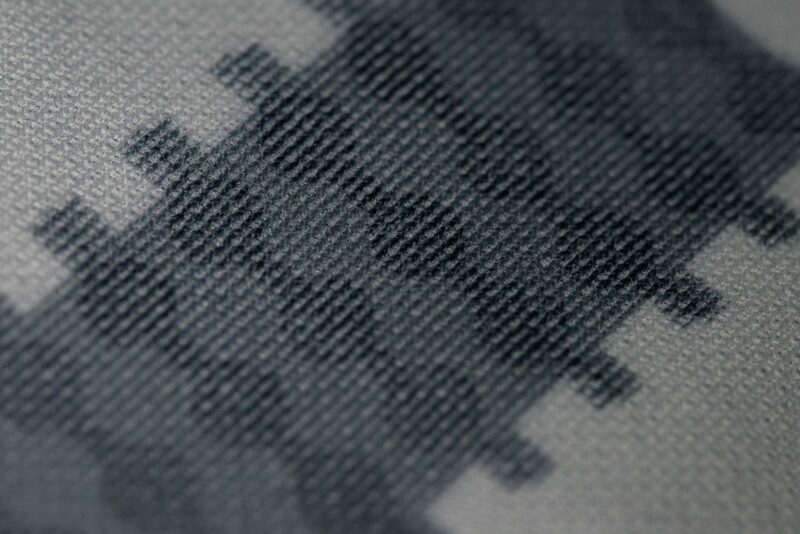 Deciding where to provide inputs and outputs on smart fabric is incredibly important for a design. With furniture or objects we interact with, it can be more straight forward, but would still require a lot of user testing with different users to get right. For clothing, it gets much more complicated. What are sensitive areas of the body we would want to avoid for inputs? How about appropriate areas for screens or lights or other outputs? If outputs or inputs they draw attention to private parts of the body, that could be disastrous in public, or just the right thing in private. We do not want to expose our customers to unwanted attention or touching, and they need to be in control of their own bodies and what technology can do to enhance them. On mobile devices, we have learned that we can distract people needlessly and take away from their real-life experiences rather than enhance them. If an app is annoying, people just delete it and move on. As designers, we must understand the context of use, such as the environment around users, and what they want to do at a particular time with the technology. We also know that people have less time and space to interact with mobile devices than they do with larger screens, so we have to develop for quick, economic interactions rather than a long workflow. For example, if I am walking outside with my smartphone, it is much harder to interact with than when I am sitting comfortably at a desk typing on my PC. If I am in a hurry, or I am in bad weather, it is even more difficult. Now think of clothing you are wearing that is designed with smart fabrics. They are even more difficult to interact with than a small smartphone. What is going on around us and our limited ability to see and interact as we move around are amplified with smart fabrics. Imagine how irritating it would be to not be able to control or turn off notifications on your clothing, or how dangerous it might be if the smart fabric distracts you when you are walking, driving or riding a bicycle. The simple interactions mantra that mobile designers repeat over and over is that much more important to take into account with smart fabrics. Wayfinding came up a lot when I talked to people about possible applications of smart fabrics. Shannon Hoover suggested that smart fabric clothing that could sync with a map service would be hugely beneficial for tourists and travellers. If clothing provided tactile indications (such as through the use of a vibration motor) and subtle visuals, finding your way in an unfamiliar place could be much more enjoyable than having your face in a smartphone or an old fashioned map. You could focus on your surroundings, and have a richer experience, without worrying about going off your planned route. The clothing would remind and guide you. This could also be safer, you wouldn’t be a target as an obvious tourist to pick pockets or scammers. Others described ideas using smart fabrics for people operating a vehicle. This technology would not be as visually distracting as looking at a smartphone or GPS map. Motorcyclists and bicycle commuters in particular found this a welcome change. Instead of relying on a handheld or mounted device that would distract their visual attention away from where the vehicle was heading, they could get tactile indications of where to go. Smart fabrics could provide the ultimate handy interface for quick reference, reminders and interactions on the go, or they could interrupt needlessly and distract away from our real world experiences. Furthermore, since the human body is a secondary user interface, there is really very little difference between touching fabric on your body and touching bare skin. Imagine rubbing your thigh in one spot 100 times a day. How do you think your leg would feel in an hour, in a day, or after a week? Simplicity is not only necessary for a good user experience, it could be necessary for our health, well being, and our relationships. Make sure to read Part 1 of this series. In Part 3 Jonathan Kohl will look at the things that could go wrong with this technology, and offer up two possible futures for products using smart fabric technology. Consulting product manager, designer, author, and speaker in the software industry. Current focus on mobile, wearables and gamification.